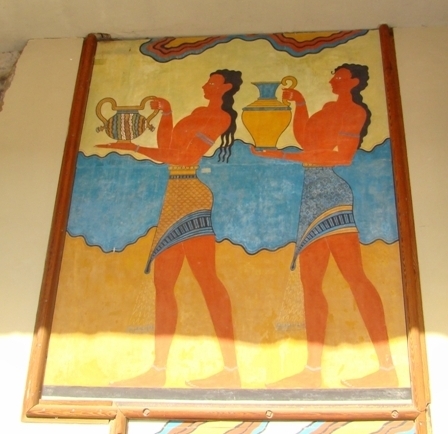 In today’s post I wish to share a few more photos and some info re: Knossos, Crete, specifically pertaining to the palace. 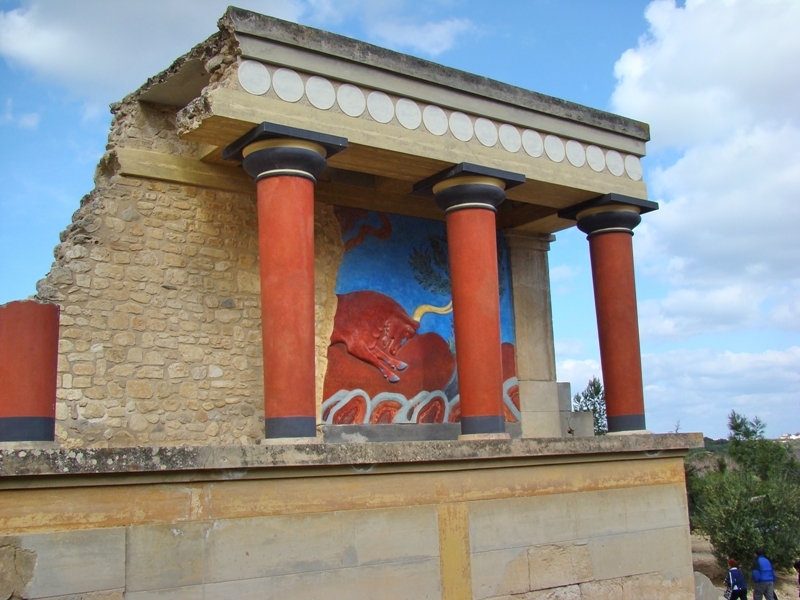 Knossos was the capital of Minoan Crete, and had the largest and most sophisticated palace on the island. The palace had more than 1,000 rooms. The archaeologist and excavator Sir Arthur Evans determined that the palace was three to five stories high. South Propylon. Entrance to palace at Knossos Crete. Photo ©Leon Mauldin. Some of our group are among the people in this photo; it was a cool, brisk March morning as you can tell by the coats most are wearing. This monumental pillared gateway was the entrance to the palace on the south side. It was decorated with the Cup-Bearer figured. See photo below. Cup-Bearer Figure decorating South Propylon. 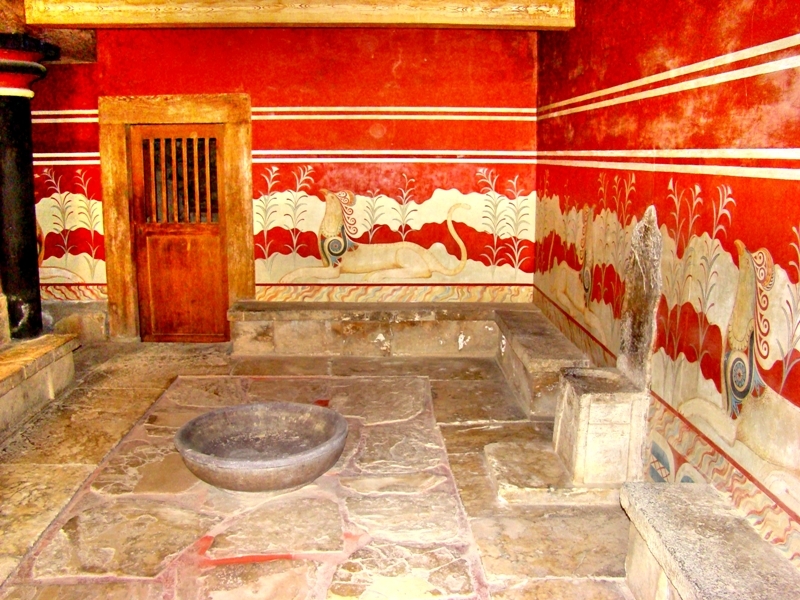 Knossos Crete. Photo ©Leon Mauldin. 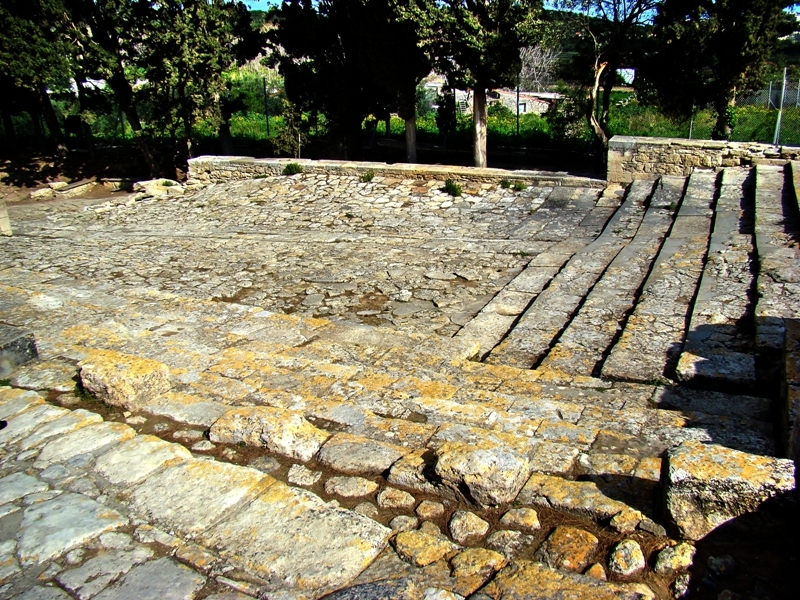 The throne room is thought to have been used as council and and law court for King Minos and the priesthood. See photo below. Throne Room for King Minos. 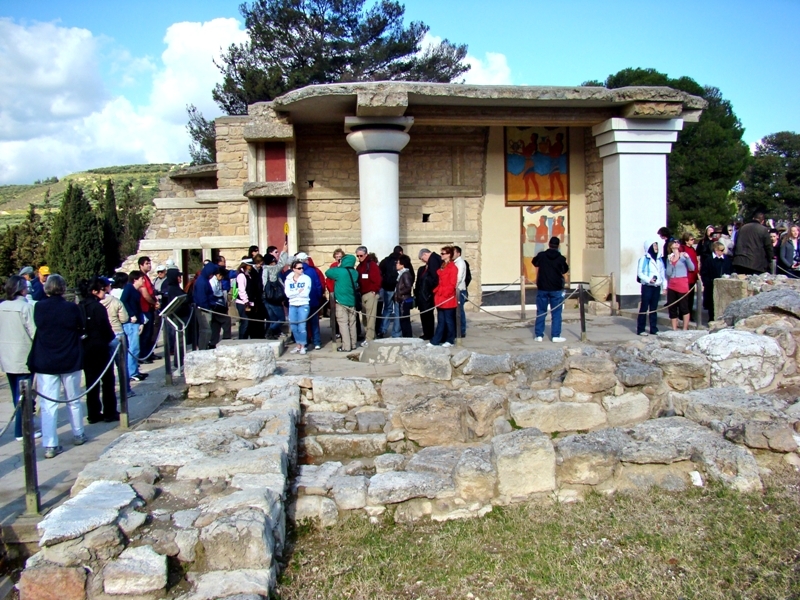 Knossos Crete. Photo ©Leon Mauldin. Note the griffins which “guarded” the throne. These mythical beasts with eagle’s head and lion’s body are thought to have symbolized royal and divine power. In the floor you see a basin, used for ritual cleansing. North Entrance for the Palace. Knossos, Crete. Photo ©Leon Mauldin. On the west side of the palace is the theater. It was a stepped court located at the end of the Royal Road. Some suggest its usage was for rituals associated with the reception of visitors. Stepped Theater at Knossos, Crete. Photo ©Leon Mauldin. The theater steps would have seated about 400 people. Remember to click on images for higher resolution. This entry was posted on Tuesday, July 20th, 2010 at 11:46 AM and is filed under Archaeology, Bible History and Geography. You can follow any responses to this entry through the RSS 2.0 feed. You can leave a response, or trackback from your own site. I would like to use your theater picture on my article named Ancient Grek Theatres. If you get permission I will be glad. I will references as Stepped Theater at Knossos, Crete. Photo ©Leon Mauldin. Send me your email address and I will send you a high resolution copy of the photo.